Participants brainstorm at the G.O.A.L. workshop in Nairobi, Kenya at ICRAF, September 2016. Availability: 90% of accessions healthy and available for immediate distribution. In 2017, approximately 79% of total accessions were immediately available for international distribution, a significant improvement from 66% in 2012. Security: 90% of samples safety duplicated in two locations by 2022. By 2017, 55% was secured in safety duplication at two levels and 73% was duplicated at the Svalbard Global Seed Vault. 79% of clonal crop collections was safety duplicated in the form of cryopreserved samples or in vitro cultures. Information: 90% of accessions have minimum passport or characterisation data online. By 2017, 727,312 (95%) accessions had been uploaded to Genesys, 66% with digital object identifiers (DOIs). The passport data completeness index (PDCI ) was 6.04 (from 5.42 in 2015). 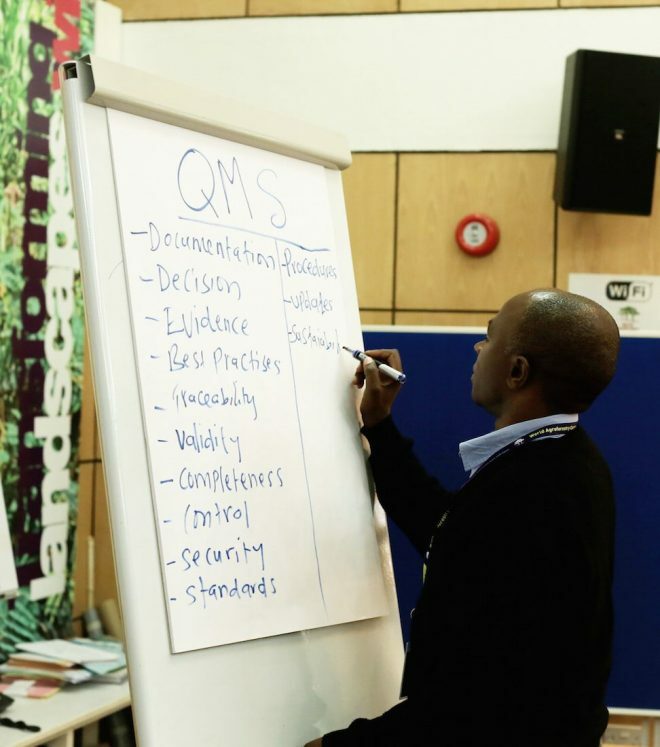 Quality Management System: agreed elements of QMS in place at all genebanks. By 2017, a total of 41 standard operating procedures (SOPs) have been written, reviewed and approved by genebank staff and their managers. CGIAR genebanks report their individual target scores to the Platform, which updates the overall targets annually. The agreements between CGIAR Centers and the ITPGRFA require genebanks to ensure their collections of PGR “shall be made available” and that Centers will “manage and administer these ex situ collections in accordance with internationally accepted standards, specifically the Genebank Standards, as endorsed by the FAO Commission on Genetic Resources for Food and Agriculture”. While all of a genebank’s accessions are, in theory, available for distribution, by 2017, 79% were available for immediate distribution. Two constraints limit availability in practice. A genebank may not have sufficient material in its active collection available to distribute, so that a request for a specific accession would have to wait until that accession is regenerated to be fulfilled. This can introduce a delay of more than a year. Sample quality is not acceptable for distribution. For example, material may be affected by seedborne diseases that contravene phytosanitary regulations and so are unsafe to distribute. The Platform has adopted a target that by 2022, 90% of the entire CGIAR collection should be phytosanitarily clean and available for rapid distribution. In addition, 90% of accessions will be duplicated for security in two locations including the Svalbard Global Seed Vault and will have minimum information available online to aid selection. All CGIAR genebanks will have the elements of a QMS in place. In addition to the overall targets for the Platform, the individual modules that make up the program have agreed targets for specific activities.